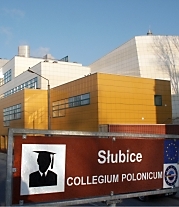 The Collegium Polonicum is a cross-border, academic institution which was jointly brought into being and is being maintained by the European University Viadrina and the Adam Mickiewicz University. Against the background of an expanding Europe, it is developing into an academic and cultural meeting place between Poland and Germany open to teachers and students from all over Europe. Its library contains an attractive collection of books, specific to major fields of study and is interesting for readers of the region. Through the Collegium Polonicum, Słubice with 17.000 inhabitants, and Frankfurt (Oder) with 64.000 inhabitants, the German "Gateway to the East", are moving even closer together.